When I was younger, my parents refused to go out and buy clothes for my Barbie dolls beyond what came with the doll herself. But I still wanted new clothes for my dolls so my dad used to sew some for me, just to placate me long enough for me to stop from whining more. One of the things he used to make for me was little sweaters and dresses from socks, so with his help I wrote this tutorial. Pretty much all of the directions are his, minus the use of stabilizer (I have no clue how he was patient enough to sew doll clothes for me with socks without stabilizer, I had a hard enough time with it!). 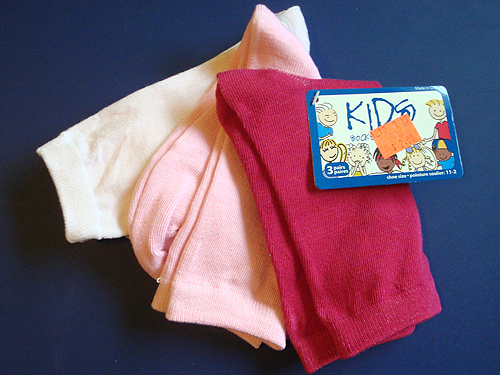 First you’ll put the sock up against your doll and figure out where you need to cut. 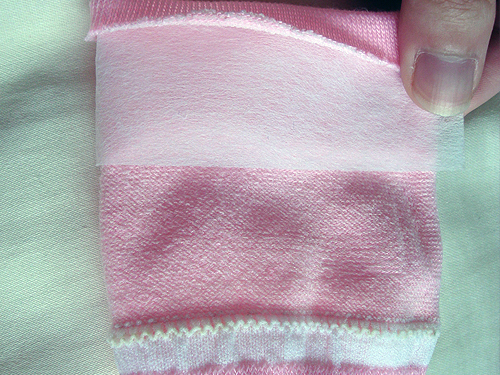 I decided that I wanted to have long sleeves, and you do need to hem the edge, so I folded the sock where I wanted the length to be and added a seam allowance before cutting. Fold over the newly cut end and put stabilizer underneath the fold and pin in place. 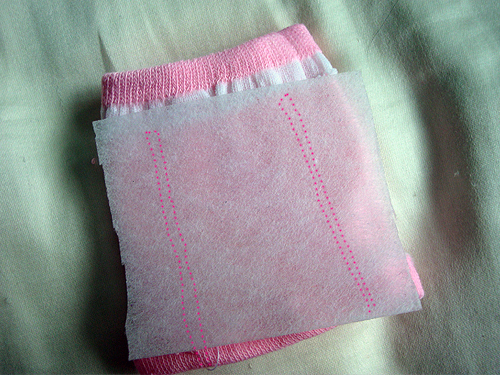 You will then sew the hem (I used a zig-zag stitch) and then tear away the stabilizer (some stabilizer brands are different, some are wash-away or designed to stay there forever – if yours is the kind that’s supposed to stay there, use something else if you can – you can use old dryer sheets). Once that’s done, you’ll want another piece of stabilizer about the size of your sock. You’ll want to use your pencil or fabric marking pen for this step: draw 4 lines from right below the sock cuff to the newly hemmed edge. You’ll sew from the newly hemmed edge up to the cuff, do 2-3 stitches over and then do a straight line back to the hemmed edge and repeat on the other side of the sock. You’ll be sewing through both layers of fabric in this stage. 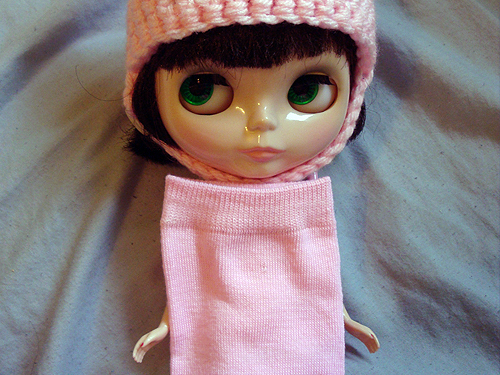 You want the arm holes to be pretty much the same size as your doll’s arms (to make it easier to put on). If the torso part of the dress is smaller than the doll, it’s okay as the material is stretchy (and it is easier to stretch for the torso than for the sleeves when putting it on). 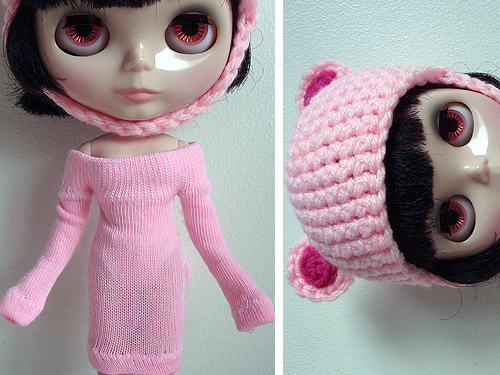 Once you turn the sleeves and body of the sweater, you can slip it onto your doll (carefully! there’s no back opening so it needs to be slid up the doll’s legs first). And there you have it! 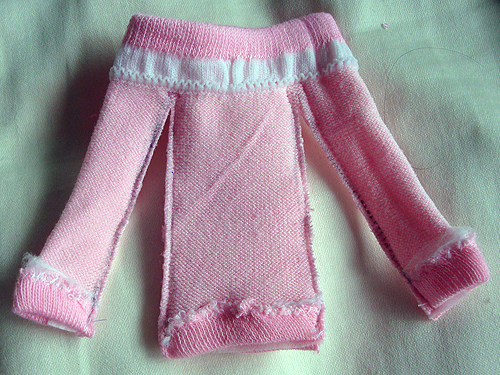 One sweater-dress for your doll made from a sock! If you want it to be more of a sweater and less of a dress, you’ll need to make it shorter. You can also adjust the sleeve lengths by re-hemming the edges (although I would probably do this by hand since it’d be rather tricky!). My girls are definitely on a budget now…this is awesome! What an awesome idea. I’m gonna try this very soon. Many thanks for the stabilizer idea! I had given up using my sewing machine and was making sock things entirely by hand stitching. Can’t wait to try this. Thanks for sharing. I have been on You Tube as well, but this is even better. You can actually see what you are supposed to be doing. 🙂 Now my first Blythe can have a dress and or sweater. Brilliant what a fab tutorial ??????????????????????????? ?